Rhabdomyosarcoma (RMS) is the most common pediatric soft tissue cancer, affecting children of all ages. Each year, approximately 300 new cases of pediatric RMS are reported in the United States (U.S.). In these children, tumors often grow and spread quickly, necessitating intensive therapy. One sub-type of RMS, known as alveolar RMS (ARMS), is particularly aggressive and difficult to treat. 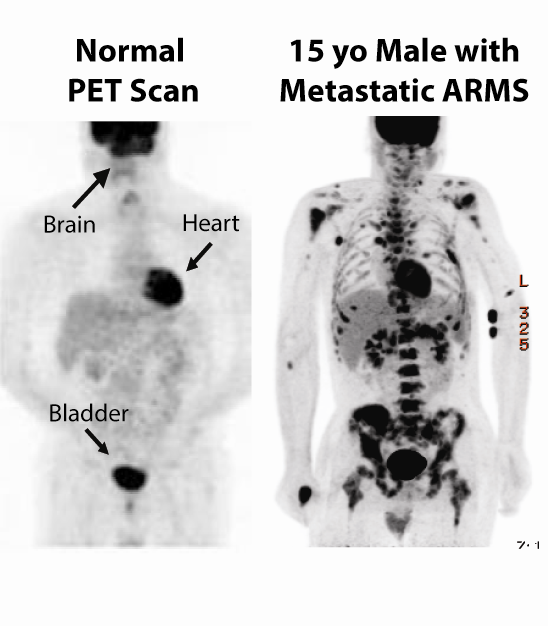 Children with ARMS tumors often have metastatic disease at diagnosis (left) and even after rigorous therapeutic regimens, approximately 50% of ARMS patients will suffer from recurrent disease. ARMS tumors most often result from unique fusions between two chromosomes, referred to as translocations, which drive tumor growth and disease progression. Despite the unique genetic aberrations associated with ARMS tumors, there are no therapies that specifically target these chromosomal mutations. Unfortunately, the lack of effective therapies means that treatment is often abandoned in children with ARMS. To date, pharmaceutical companies have been reluctant to develop targeted therapies for ARMS, in part because of the relatively small market opportunity. Furthermore, attempts to identify novel ARMS drugs in academic laboratories have been unsuccessful. However, these studies used small compound libraries coupled with model systems inappropriately tailored to identify ARMS-selective drugs. Technique to label cells expressing inducible ARMS translocation fusion genes with 3 unique fluorescent proteins. Against this backdrop, our laboratory is pioneering an approach to identify new therapies for ARMS that are uniquely founded on the chromosomal translocations underlying this disease. To accomplish this, we have developed novel, live-cell screening platforms to search for selective inhibitors of tumor cells that express the characteristic ARMS translocations. 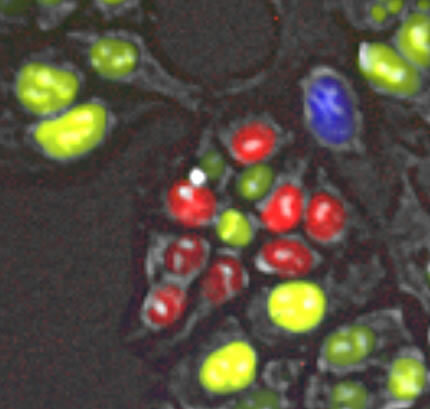 We have developed novel techniques to label cells expressing inducible ARMS translocation fusion genes with 3 unique fluorescent proteins (left). Our approach is distinct from previous studies because we propose to use model sarcoma cell lines that differ only in the expression of ARMS-associated translocations. If successful, the identified compounds can be advanced as ARMS therapeutics in subsequent studies, which could provide new treatment options for children suffering from this disease.